Add onions and peppers and season with 1 teaspoon of House Seasoning Blend. Saute for 5 minutes or until onions and peppers soften. Add garlic and stir for 30 seconds, or until fragrant. Remove peppers, onions and garlic from pan and set aside. Return skillet to burner and heat remaining tablespoon of olive oil over medium high heat. Season beef with remaining teaspoon of House Seasoning Blend. Saute beef for 3-5 minutes or until almost cooked through. 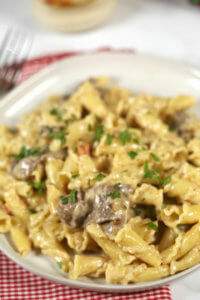 Turn heat down to simmer and add cooked vegetables, Alfredo sauce and pasta to the skillet; stir to combine. Simmer for 10 minutes to allow flavors to come together. If sauce is too thick, add some of the reserved pasta water to thin sauce to desired consistency. Right before serving, top with provolone cheese and add lid to allow cheese to melt.